John Barrett, son of WHO and WHO, was born abt. 1562 in Worfield, England and died in 1644 in Norwich, England. He married Jenor Wallacomb, daughter of WHO and WHO, on WHEN in WHERE. Jenor was born 8 Jan 1560 in Cranbrook, England and died WHEN in WHERE, England. As of this writing, the only child researched is Humphrey Barrett Sr. [see Generation 8]. Thomas Barrett was born abt. 1621 in WHERE, England and died on 14 Jun 1652 in Concord, MA. He married Elizabeth UNKNOWN, daughter of WHO and WHO, in 1648 in Concord, MA. Humphrey Barrett Jr. was born abt. 1630 in WHERE, England and died on 3 Jan 1715 in Concord, MA. He married Mary Potter, daughter of WHO and WHO, on 23 Mar 1674 in Concord, MA. Mary was born abt. 1655 in Concord, MA and died there on 17 Nov 1713. John Barrett was born abt. 1635 in Concord, MA and died on 22 Jul 1711 in Marlborough, MA. He married Mary Pond, daughter of WHO and WHO, on 19 Sep 1656 in ?Sudbury, MA?. James Barrett, son of Humphrey Barrett and Mary Hawes, was born abt. 1615 in Wendham, England and died on 16 Aug 1672 in Charlestown, MA. He married Anna Fosdick, daughter of Stephen Fosdick and Ann Harre, abt. 1642 in WHERE. Anna was born in Mar 1615 in Wenham, England and died on 20 Jun 1681 in Malden, MA. As of this writing, the only child researched is James Barrett [see Generation 6]. James Barrett was born abt. 1672 in Malden, MA and died there on 31 Jul 1740. He married Anna Bryant, daughter of WHO and WHO, on 30 May 1694 in WHERE, MA. Jonathan Barrett was born abt. 1677 in Malden, MA and died there on 7 Sep 1749. He married Abigail Tuttle, daughter of WHO and WHO, on 8 Dec 1698 in WHERE. She was born on 14 Feb 1677 in Boston, MA and died on 23 Oct 1715 in Malden, MA. John Barrett was born 1740 in Killingly, CT and died 1820 in Woodstock, CT.
Abigail Barrett was born 1 Oct 1733 in Killingly, MA and died 1768 in Thompson, CT. She married Benjamin Joslin, son of WHO and WHO, 4 Jan 1753 in Killingly, CT. He was born 31 Jul 1728 in Killingly, CT and died there in 1846. Amos Barrett was born 1 May 1751 in Killingly, CT and died 28 Nov 1831 in Hindsdale, MA. He married Olive Hurd, daughter of WHO and WHO, 7 Dec 1780 in Voluntown, CT. She was born there abt. 1751 and died 2 May 1837 in Hindsdale, MA. Child: Arna Barrett. Anna Barrett was born 10 Feb 1753 in Killingly, CT and died two days later on 12 Feb 1753. Eunice Barrett was born 27 Mar 1754 in Killingly, CT and died WHEN in WHERE. Sarah Barrett was born 5 Nov 1755 in Killingly, CT and died WHEN in WHERE. Esther Barrett was born 5 Mar 1758 in Killingly, CT and died WHEN in WHERE. 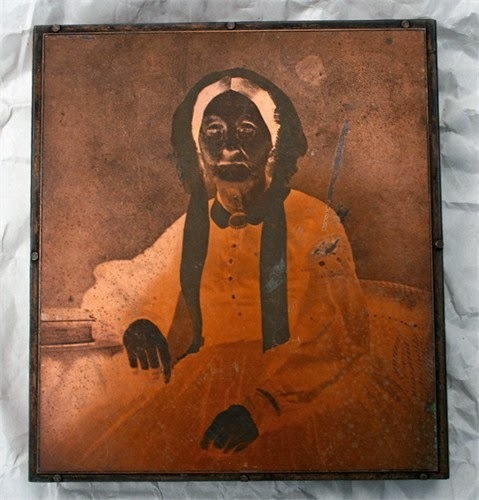 Jonathan Barrett was born 29 Mar 1760 in Killingly, CT and died 13 May 1839 in Hamilton, OH. He married Rachel Brace. Nathan Barrett was born 2 May 1766 in Killingly, CT and died WHEN in WHERE. He married Alice UNKNOWN, daughter of WHO and WOH. She was born abt. 1765 in Killingly, CT and died 23 Dec 1799 in Hindsdale, MA. Ruth Barrett was born 14 Jun 1770 in Killingly, CT and died WHEN in WHERE. Joseph Barrett was born 19 May 1772 in Killingly, CT and died WHEN in WHERE. Samuel Barrett was born 29 Jun 1775 in Killingly, CT and died WHEN in WHERE. James Barrett was born abt. 1789 in Plainfield, CT and died WHEN in WHERE. William P. Barrett was born abt. 1794 in Plainfield, CT and died 10 Oct 1868 in Fenner, NY. Anthony Barrett was born 21 Sep 1800 in Plainfield, CT and died 5 Jan 1849 in Fenner, NY. He married Sarah Ann Wilcoxen. Haskell Barrett was born abt. 1802 in Plainfield, CT and died WHEN in WHERE. Baldwin Barrett was born abt. 1805 in Plainfield, CT and died WHEN in WHERE. Amos Barrett was born abt. 1809 in Plainfield, CT and died 17 Jun 1811 in Thompson, CT.
William Henry Barrett was born bet. 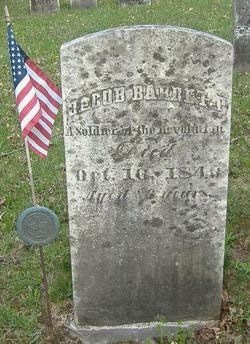 1817-1819 in CT and died 7 Mar 1870. He married Catherine Dewey, daughter of Timothy Dewey and Clarissa Sacket, 8 Apr 1844 in Tariffville, CT. She was born abt. 1822 in Westfield, MA and died aft. 1880 in Amherst, MA. Child: Clara B. Barrett. 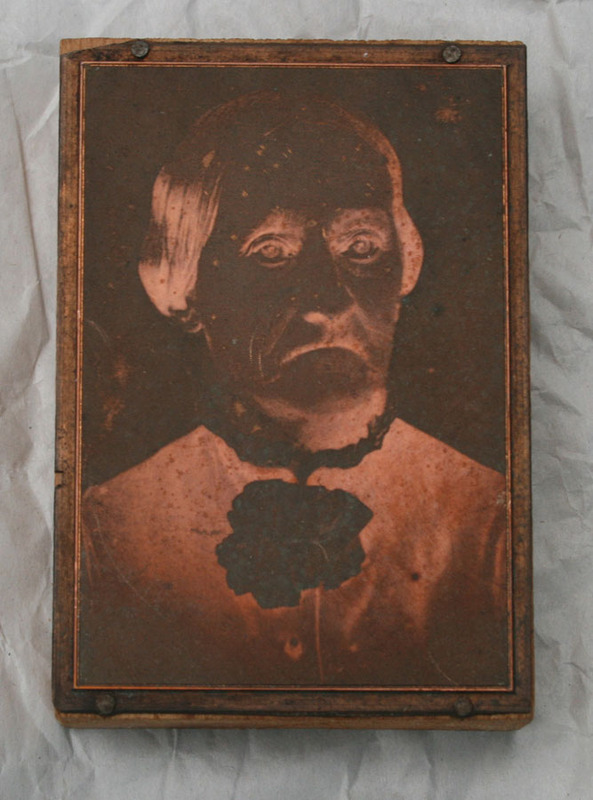 Asenath S. Barrett was born 21 Oct 1817 in CT and died 29 Jun 1885 in Lisle, NY. She married David H. Finn, son of WHO and WHO, 3 Jun 1838 in Turkey Hills (E. Granby), CT. He was born 9 Feb 1812 in Greene, NY and died 14 May 1899 in Lisle, NY. Children: Harriett “Hattie” Finn, Charles Finn and William Finn. 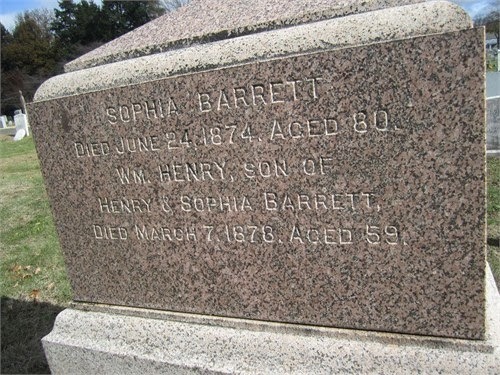 Eliza Ann Barrett, daughter of Henry Barrett and Sophia Fenton, was born 14 Nov 1815 in Thompsonville, CT and died 15 Apr 1891 in Andover, CT. She married: (1) Robert Holmes Jr., son of Robert Holmes and Delilah Holmes, 29 Mar 1839 in Simsbury, CT. He was born 4 Apr 1815 in Killygordon, Donegal, Ireland and died 13 Feb 1858 in E. Granby, CT [Ref. http://holmesgenealogy.blogspot.com]; and (2) Alexander Pattison, son of Joseph Pattison and Mary Brown, aft. Feb 1858 in (likely) Granby. He was born 1829 in Pharis, Loughguile, Antrim, Ireland and died 23 Jan 1897 in Andover, CT. Children of Robert and Eliza: David H. Holmes, Ellen Eliza Holmes, Charles Robert Holmes and Cyrus E. Holmes. In 1731 the new county movement carried the day, and Woodstock, with many northward towns, was incorporated into Wore tester county. This distant frontier town furnished the leading officers. Already colonel of the regiment, John Chandler, Sr., was now made judge of probate and chief justice of the court of common pleas. John Chandler, Jr., was appointed clerk of the court, and by especial request of the inhabitants removed his residence to Worcester. The first court in the new county was held in judge Chandler's Woodstock mansion, wherein much legal and public business was transacted. A new road was now laid out from Worcester to Woodstock line, to accommodate business and travel. Woodstock ranked among the foremost towns of the county, its tax list only surpassed by some of the older townships. A well-patronized select school gave evidence of prosperity and progress. Some seventy pupils were reported by its master, Thaddeus Mason, including pupils from the best families in Pomfret and Killingly. An attempt was made to establish a permanent Grammar or high school-the town voting to build a school house for the accommodation of grown children, not hindering subordinate schools. This vote called out one of Woodstock's characteristic controversies. Thirty out of sixtynine voters dissented from this vote. A strong memorial was immediately prepared, signed by Colonel Chandler, Eliphalet Carpenter, John Holmes, Henry Bowen, and other 'prominent men, showing that this matter had been laid over to this June 8th, 1730, "to be farther considered on," but instead was not only considered "but transacted upon in a way very grievous to a great number of the inhabitants," and for "preventing any contests, heats or disputes," desired that another town meeting might be called. Though held in the busiest time of the year over a hundred voters were present at this meeting: The former vote was annulled, the new school house for "grown children" countermanded, and directions given for repairing the old Plaine hill school house. In 1731 liberty was given to build a school house in the north half. The appointed committee affixed the site, east side the highway leading from the house of Ephraim Child to Maturin Allard's, but this site was considered too far eastward. Captain Payson, Moses Barrett, Joseph Chaffee, Jonathan Bugbee and Nathaniel Sanger were appointed a committee to view the site John May, Benjamin Child and Maturin Allard, to take care of building said house, but still the work did not go forward. Several other families of Child had now settled in this section, and many children were growing up, and while waiting to agree upon a building site schools were maintained in private houses. John May and Jonathan Morse taught in the winter; school ma'ams were employed in the several sections in the summer. The town at this date was much exercised by a controversy with its most prominent citizen, Judge Chandler. Deacon William Lyon superseded him as moderator of town meeting; Isaac Tiffany as town clerk; David Holmes as town treasurer. Judge Chandler refused to deliver up the town records, "because proprietors' concerns are mixt with ye town's" and declined "to transcribe what belongs to proprietors from the town books without some adequate compensation. The town, on her part, "refused to be at the charge of transcribing proprietors' concerns from town affairs," and ordered the selectmen "to get and procure town books from Hon. John Chandler, as speedily as they can by the most prudential ways and means as they shall judge best." Judge Chandler also disagreed with the town in relation to the settlement of a minister in place of Reverend Amos Throop, deceased. A call was extended to Mr. John Hovey to become their pastor. A tendency to override technicalities, and manage affairs in a somewhat independent fashion, was severely censured by the honorable judge, who 11 apprehended the whole proceedings both in church and town were the product of arbitrary or mobbish principles, and the foundation being laid upon the sand, the superstructure cannot long continue. The town responded by appointing as agents Deacon William Lyon, Captain Payson and Lieutenant Morris, "To demand, sue for and recover the town book of records." Mr. Hovey declining this irregular call, the town concurred with the church in sending to New Haven "to invite Mr. Abel Stiles to preach with them by way of probation." A large majority expressing their satisfaction with the ministerial performances and qualifications of the candidate, he was ordained pastor of church and town, July 27th, 1737. Able and accomplished, the only drawback in this relation was Mr. Stiles' preference for Connecticut's form of church government. He did not, however, explicitly refuse to sign the church covenant, but presented a written statement of his own views and principles, which was considered satisfactory. This harmonious settlement contributed to further pacification. Colonel Chandler was again chosen moderator of town meetings. Twenty-five pounds was allowed him for twenty-six years' service as town clerk, and other demands conceded. School divisions were confirmed in 1738. Captain John May, Deacon William Lyon, Jedidiah Frizzell, James Chaffee and Benjamin Bugbee served as committee in setting the bounds of schools in the several parts of the town, "so that one part may not send their children to any other part, and every part enjoy its own school without being interrupted by any other part." The "parts" thus assigned were the central school at Plaine hill, the southeast quarter, the northeast quarter, and the whole west side of the town. A fifth section was soon after set off at Wabbaquasset, in the south of the town. The settlement of the western part of Woodstock had now made considerable progress. Its south half had been laid out to original proprietors, and was occupied mainly by their sons. Joshua, third son of judge Chandler, was one of the first to take possession of his father's out-division, "Lot 23, third range," in the heart of the future village of West Woodstock. He was soon followed by other adventurous youths, viz., Thomas and John Child, John and Joseph Marcy, Nathaniel Johnson, John Perrin, Ebenezer Lyon, Benjamin Corbin, Samuel and Jesse Bugbee, Nathaniel Aspinwall, Ebenezer and Abraham Paine, children of first planters, eager to establish themselves in this pleasant and fertile section. No part of the town was settled under more favorable circumstances-a body of well trained young men, with friends at hand to help and encourage them. In 1731 a two months' school was allowed by the town. In 1733 it was voted "That the inhabitants dwelling on the west side of a due north and south line from the top of Fort hill to the dividend lines on the north and south bounds of the town have liberty to meet together and agree where a school house may be built." Improving this privilege, the western residents met together and voted "That the best place for a school house is north of Clay-pit Brook, between Joshua Chandler's and John Paine's lots." This house being constructed, other needs were manifested. In 1736 it was found that thirty-five families had gathered within the limits of the west school who were exposed to great hardships and difficulties, especially in cold and difficult times of the year in travelling to and from public worship in the distant Plaine Hill meeting house. Having borne cheerfully their part of public charges, these westward residents now asked the town to help them pay the expense of hiring a minister through the winter. The town granted liberty to have preaching at their own cost, but refused to afford any help toward its support. After five years' efforts and trials, the western inhabitants again most earnestly besought their friends and neighbors to take their remote and difficult circumstances into their compassionate consideration, and in order to settle the worship of God suitably among them, allow the western half to be erected into a separate town. Aghast at this presumption, the town positively refused to grant its countenance and consent to the western inhabitants. Again, in the spring of 1742, the petitioners pressed their suit, and succeeded by a majority of two in gaining permission to address the general court. July 2d Benjamin Marcy and thirty-five others forcibly represented "their inconvenience by reason of remoteness from public worship," and gained encouragement to hope that a precinct might be allowed them. Another appeal was made to their obdurate fellow townsmen, not willing "to drive things to extremities," the settlement of public worship the principal thing we aim at, "but again were scornfully repulsed. With equal firmness the western inhabitants again preferred their request to the general court, showing their condition, the distance which each petitioner and his family were obliged to travel to the crowded meeting house on Plaine hill, and begging humbly to be set off into a distinct and separate precinct. A very strong and forcible response from the old inhabitants of the town, headed by Judge Chandler, could not in this instance stay the march of progress. A committee appointed to repair to Woodstock and view the situation reported in favor of the petitioners. September 15th, 1743, the report of the committee was accepted, and the " west half part of Woodstock erected into a separate and distinct township, and vested with all the rights and privileges that precincts by law enjoy." The first parish meeting was held in the one school house, September 27th. John Marcy served as moderator; Isaac Johnson, clerk; Joseph Chaffee, Joseph Marcy and Ebenezer Lyon were chosen society committee; Joseph Chaffee, Moses Lyon and Isaac Johnson, assessors; John Marcy, treasurer. Ebenezer Smith, John Child and Nathaniel Johnson served as committee, with Captain John May, Jabez Lyon and Daniel Paine of the old society, in affixing the bound between the precincts by a north and south line through the center of the town. The new society assumed the name of New Roxbury, and at once devoted its energies to the establishment of public worship. A tax of two pence a year on all unimproved land, to be applied toward building a meeting house and settling a minister, was allowed by the general assembly. After discussion and delay, the" decisive .spot for meeting house" was fixed upon by a committee from .abroad, viz., Robert Knowlton, Joseph Leavens and Mr. Walbridge; Isaac Johnson, Joseph Chaffee, Ebenezer Paine, Thomas 'Child, Jonathan Bugbee, Ebenezer Corbin waiting upon them. After four days' deliberation " a dry knoll east of Bungee Hill " was selected. Mr. Joshua Chandler giving an acre of land for building site. Equal deliberation was manifested in choosing a minister. The successful candidate was Mr. Stephen Williams of Longmeadow, Mass., the worthy son of honored ministerial .ancestry. The meeting house was raised in 1746, and made ready for service the following year. A day of fasting preparatory to that of ordination was held in June, 1747, at which time Woodstock's second church was organized, and on June 24th the -ordination was effected. Fifty acres of good land and a suitable dwelling house were provided for the young minister, and thus, after ten years' effort, religious worship was prosperously -established. The first meeting of the east half as a distinct parish was held March 6th, 1744. John Holmes was chosen moderator; Thomas Chandler, clerk and treasurer; jabez Lyon, John Frizzell, Thomas Chandler, assessors; Richard Child, Benjamin Bugbee, collectors; Captain Jonathan Payson, Captain Joseph Wright, Captain Samuel Chandler, committee to call precinct meetings and take -care of the prudentials, viz., to sweep the meeting house, mend the glass, etc., at the charge of the precinct. All matters relative to ecclesiastic and school affairs were now referred to the two societies. Five schools were maintained by the first society, viz., Center, North, South, West and Wabbaquasset. New school houses were built " in the southeast part in the old spot," and at Wabbaquasset, sixteen feet square, beside chimney way. A more spacious and elaborate house was provided for the center at Plaine hill. The north district, after ten years' considoration agreed upon the spot where the highways intersect, east of Capt. Child's house," near the mill site on Muddy brook. The petitioners from the four " Indented towns " asked to be received under the jurisdiction of Connecticut, upon the ground that the territory of their towns was included in the original .grant to that government, and that the boundary settlement of 1713, under which they were allowed to remain in Massachusetts, had never received the royal sanction, and they did not believe that commissioners could transfer or alter the jurisdiction of lands given by royal charter, and that the doing of the same was an infringement on the rights of the subject. The assembly appointed a committee of honorable gentlemen to confer with gentlemen from Massachusetts, who failing in this effort, were farther empowered to consider the affair, and reported in favor of the memorialists. After two years' delay and reiterated memorials, the Connecticut assembly decided that the boundary agreement of 1713 was made through mistake, that Connecticut had received no equivalent for the jurisdiction of these towns, and as the agreement had never received royal confirmation, so it never ought to receive it, and must be looked upon as null and void, and solemnly declared, "that the inhabitants south of the line fixed by Massachusetts were within and had right to the privileges of Connecticut Government." This decision was received with delight by a large majority of the inhabitants of Woodstock, whose interest in the matter had been greatly stimulated by two years' agitation. A warning from a Connecticut justice soon summoned them" to the choice of proper town officers, of which they were destitute." This "notable meeting" was held in the first meeting house, Friday, 10 A. M., July 28th, 1749 (0. S.). Justice Joseph Leavens, of Killingly, a native of Woodstock, presided. Before entering upon the business of the day, a formal protest was entered by Samuel Chandler, John, Jonathan, Nathan and Asa Payson, John Frizzell, Joseph Wright, Zebulon Dodge and Joseph Griggs, declaring that the meeting was wholly unlawful and had a tendency to stir up the greatest confusion and disorder, if not rebellion. Deciding to take no further notice of this protest, John May was chosen moderator; Henry Bowen, town clerk and first selectman; Isaac Johnson, second selectman; Jabez Lyon, third; Abraham Perrin, fourth; John May, fifth; Andrew Durkee and Ebenezer Paine, constables; Benjamin Bugbee and Samuel Child, grand jurors; all sworn into office by Justice Leavens. William and Daniel Lyon, John Morse, Ephraim and Benjamin Child, Henry Bowen, Thomas Chandler, Daniel Paine and Nathaniel Johnson were then approved to take the freeman's oath agreeably to the laws of Connecticut. At the following town meeting seventy-four additional residents were admitted freemen, and Thomas Chandler and Henry Bowen chosen representatives to the general assembly. Transference of allegiance had thus been practically effected, and Woodstock enrolled among Connecticut townships. Massachusetts, meanwhile, wholly refused to accept the situation. Spirited remonstrances were laid before the Connecticut assembly; warrants and writs were served upon her revolted subjects; commissioners failed even to agree upon terms of negotiation. Both governments, after some years of bickering and wrangling, attempted to lay their claims before the crown, but owing to many hindrances and public disturbances did not succeed in gaining a hearing. After the close of the French and Indian war another attempt was made to gain a decision from supreme authority in Great Britain, but the revolutionary troubles again prevented its consideration, and the revolted towns were left to Connecticut dominion, according to the original grant of territory. The aggrieved memorialists of Woodstock continued to protest against this transfer, but were forced in time to submit to the will of the majority. In many respects the change was greatly to its advantage. The population of the town in 1753 was 1,336 whites, 30 blacks; value of estates £16,500. This is the contents of a book written in 1886 by Rev. Newton Barrett. As explained in the first paragraph Rev. Barrett has incorporated and expanded on data compiled by his father Simon Barrett in 1825. Thus most of the data in the book has been compiled by interviewing relatives and from personal knowledge and recollection of the author. Deacon Simon Barret of Woodstock, Connecticut, at his death in 1838, left "A Family Record of the Births and Deaths of Smith Barret’s Family", which he seems to have copied from an original record, on his leaving Woodstock in 1807 or 1809, and afterward extended. It begins with the birth of Moses Barret in 1685, which Moses was the father of the Woodstock branch of the family. Simon continued his record to 1830. The present record is able to add five generations to the five with which it begins – three earlier and two later – and to include Thomas Barrett, Sr., who unites the New with the Old England division of our family. Thomas Barrett Sr.’s parents and home in England this record cannot identify. His lineage is not lost but becomes indistinguishable before 1600; the name is in Doomsday Book 1086, and is found repeatedly thenceforward among both noble and ignoble. Authorities say that Barret was found as a Saxon name in England before the Norman Conquest in 1066, and is from a Teutonic root – but if it is found at all among German nations any actual instance is unknown, while it has been common immemorially in France and Italy and is traceable to a well known root – baret – in Celtic speech. The stronger probability is that the name of Barret came from France to England at the Norman Conquest and so spread through England and Ireland, in which it has long been and still is very prevalent. It is also becoming universal in this country by the constant emigrations from both its New England and British Centers. If the parentage of Thomas Barrett Sr. of Chelmsford, Mass., is ever discovered it will doubtless be in the parish registers or probate records of England somewhere between Old Boston and Old Chelmsford or from Canterbuy to Lincoln, Norwich, perhaps. Note: The best genealogical works are now becoming generally accessible. For the facts as to the name of Barret in Doomsday Book – in Saxon England and in France – a high authority is “Lower’s Patronymic Brittanica.” For the nobility of the name see “Burke’s General Armory” also “County Families of England and Ireland” and a volume of “Coats of Arms” (illustrated folio) copies of all of which are in the Library of the New England Genealogical Society, Boston. For a single explicit instance, see Mumford’s “Local Names of Norfolk”, which says that “Ringsted Parva” a “hundred” or pariah in Doomsday Book was called “Barret Ringsted” from the Barrets who were lords of that place from Henry IV. To Henry VII. Or 1400 to 1500. Green’s History of England, Book III. Chap. I., says: “A separate French town was side by side with the English borough 1200 A.D. at Norwich.” I failed to find Barret in a three hour’s thumbing of Doomsday Book in Washington, 1887. Some poorhouse and penitentiary lists could be quoted for the ignoble end. The sources from which I have added the three earliest generations on this record are the town records of Chelmsford, Mass., and particularly a letter of Judge J.H. Barrett, Loveland, Clement Co., Ohio, for Thomas Barrett, Sr., dated June, 1885. Thomas Barrett, the father of our family in this country, was one of the settlers who came over from England under the first great “Western Fever.” England under Elizabeth had grown to have more people than it could provide for with its old ideas and modes of living, so that people and ruler chafed and harried each other in town life and Church life and State life. The nation had found a world of new western land. The first of our periodical Western Fevers broke out violently. The great London and Plymouth Land Companies got these lands of the kings James I. and Charles I. and sold them out again to sub-companies or colonies for little direct money but for political and commercial equivalents. A few speculating courtiers, capitalists and merchants who saw large money in the new land, fisheries, pelts, crops and trade, brought or sent over their capital, goods and men. Many more of the surplus commoners who were sick of being underlings and wanted lands and shops and town and church meetings of their own took the new contagion and set their faces west. The company officers drew up and published their offers of land, gathered their emigrants, hired their ships, loaded and sent them over. The landing on James River, Virginia, was 1607, at Plymouth Rock, 1620. A crew made wiser and stronger by their reports came to Salem and Boston in 1629 and 1630 and cabined at the mouth of the Charles River on both sides. Shipload followed shipload. The company set off land in bulk, so many miles square to so many settlers organized into a township. The town meeting laid out the land in “home lots” of 40 acres, more or less, allotted one to each man and held the rest for newcomers on the same terms. The company made such grants to single patentees sometimes, and by some means the settlers became often owners of much land additional to their gratuitous home lots. But every man, mechanic and farmer could have his home lot and so be a freeman. Indentured workmen so became freemen. By 1635 eight towns had been settled about the Bay, Charlestown, Boston, Cambridge, Watertown, Lynn, Roxbury, Dorchester and Medford, and Concord, 20 miles north in the wilderness and Braintree, 10 miles south, had been organized in this day, and every town had also its church and minister. At least there were 7 churches. The nonconforming clergy and the Conventicle laity made the Fever a means of bringing nonconformity to New England and rendezvoused at Boston. Cotton was there. Elliott was at Roxbury in 1632. In 1635 3000 persons had entered the colony, of which 300 were lords of land and also members of churches and by these two qualifications were “freeman”, i.e. voters. They met at Cambridge once annually, en masse, and with the company officers for a senate formed the little congress of the colony, chartering and endowing with land new towns and regulating the older ones. To this little colony and at this time came our Thomas. By 1640 New Haven and Connecticut River and Narragansett Bay and New Hampshire and Maine were opened. 21,000 immigrants had come in and brought an average of $40 per capita, $1,000,000. Not many Royalists, not many “churchmen” and yet secular as well as Puritan Yankees in both thinking and living. The Concord Barrets have a legend one form of which is that about 1640 three brothers came over, of whom one died childless. The second settled in Concord, chartered 1633. (1) That Humphrey Barrett had two sons only, Thomas and Humphrey Jr. Another version is that Humphrey Sr. had four sons (perhaps more) in Thomas, Humphrey, John and James, and that he died in Concord at the age of seventy, in 1662. (2) That Humphrey settled in Concord and had sons John and Thomas and made his will Jan. 1, 1662, is matter of record. Strangely, it is on record that a third John and Thomas Barrett of like age, but whose father is not known, were settled in Marlborough, next west of Concord, which confirms the legend of the three brothers. Judge Barrett, of Loveland, Ohio adopts this theory, that the father of the brothers was John. He has found the old wills in Cambridge. The Concord genealogy was written as it claims in 1794. It settles the second of the three brothers in Boston. A Boston stock, beginning probably with Samuel, was formed at that date. But how the Concord compiler could have been ignorant of the Chelmsford family is unaccountable. Thomas Barrett Sr.’s earlier life is outlined by the fact that his son Thomas was married in 1654. John was born before Thomas Jr. Their birth would more probably be before their parents came from England than after. If not, the parents were here 1630-1635. Humphrey is said to have come around 1640. The birth of Thomas Sr. must be dated not later than 1605, and could hardly be as early as the legend puts Humphrey, 1592. The place of his birth had hardly a clue, but (1) Ths. B. Sr. in Braintree, 1644, had a friend Ed. Spalding; their families were intimate (Smith Barett married a Spalding.) (2) John Elliott had in his Roxbury Church Margaret Spalding, widow, both Margaret Barrett, came from Norwich, England, 1633, to Roxbury. A Norwich Barrett might be father of Thomas. W. Appleton, of Boston, 1881, in N.E. Gen. Reg. believes Concord Barretts came from Kent. A fairly common name that has puzzled many writers and is almost certainly a nickname is Barratt or Barrett. It has over 500 examples in the London directory and can be found frequently in medieval documents. The earliest example on record is that of Gamel Baret (or Bared), a Yorkshire landowner in the Domesday Book. Gamel is a Norse word meaning old which was often used as a personal name (surviving as Gammell, Gamble or Gamlin), and if this man's nickname was also Scandinavian it may have come from the Norse barthr meaning beard. However there is little sign of this word recurring in this two-syllable form, either as a common noun or name. Some other origin must be responsible for the crop of Barats (often spelt Barate) that appears in several southern counties in the twelfth century. The only word that can account for them is the Old French barat which signified cunning, trickery and fraud, and is now obsolete except in the legal term "Barratry". This is a curious meaning for so common a name; however, there are grounds for believing that its earlier significance was of a better nature, in fact something like business efficiency, but a deceitful note crept into it, causing it to fall into disfavour and become obsolete, though not before it had given rise to many nicknames. The great majority of Barratts or Barretts belong to this type of meaning. Some few may go back to the bearded Viking from Yorkshire, some very few may be descended from the Norman Christian named Beraud (there is no real evidence of this), but most were examples of this colloquial word for a sharp dealer, which came into fashion just at the right time to make surnames and then it disappeared again from use. In a letter from Mrs. Matthews she writes; As to the nickname Barat or Barate which appears quite often in England in the 12th century and which I still believe is the principal origin of this name, it seems to have been one of those vogue words, popular for a short time and then forgotten. Its period of being "in" just happened to coincide with the most fortunate period of surnames, among the better class. This was a French word and so the name would be found first among Normans whether they went to Ireland or stayed in England. The same goes for the Christian names Beraud or Berard. In England, of course, they became completely anglicised and the name was spelt in many ways in the middle ages. As to "alias" you must think of the period when surnames were being formed and used, but not yet completely fixed. Up to, say, 1400 many people would be called sometimes by one name and sometimes by another. Names have never been regulated by law. By about 1500 the custom of everyone having one surname only and keeping it was generally established, but for a long time there were exceptions. When a man bought land or had his name on a legal deed the lawyer would be sure to put down any alternative name that he might possibly be known by somewhere. Halsted's History of Kent states that the ancestor of the Barrett family is recorded in the Battle Abby Roll as one of those who came over with William, the Conqueror. There is evidence, however, of even greater antiquity; one etymologist says that the name is a person one of Teutonic origin. In the course of history the name has had veried spellings, such as: Barret, Barrit, Barritt, Barratt, Barrot, Barrett and Barretti ... the last of which is the Italian form of the name. Records of the 12th Century list Barretts in England in Suffolk, Bedford, Cambridge and Norfolk Counties. They are in Ireland in the Counties of Limerick, Cork and Dublin. There are several branches of the Barrett family in England ... all apparently are related to the Belhouse line. The ancestor of this line is the one who is said to have come over with William the Conqueror. The immediate founder of this line was John Barrett of Hawkherst, Kent. During the reign of Henry IV he married Alice Belhouse who inherited her father's seat, Belhouse (now Belhus) as well as extensive manors in Essex in the Parish of Avely. Their descendants continued to live there for many generations; some of those in the male line uniting with great houses as that of Somerset (Earls of Worcester) and that of Tufnell and Belham (Lords of Chicester). This line became extinct with Sir Edward Barrett, Lord Newburgh, a representative Chancellor of the Dutchy of Lancaster, who died in 1644 without issue. He bequeathed the manor and estate of Belhous to Richard Lennard, son of Lord Dacre, upon condition that he use the name and arms of Barrett, whereupon Richard Lennard took the arms of the ancient house which are described thus: "Party per pale, barry of four, counterchanged, argent and gules." He also assumed the name of Barrett-Lennard which family is still in existence. It is recorded that Thomas Barrett lived in Cambridge, Warwickshire, England during the early part of the 17th Century. He was the immediate progenitor of those younger branches of the family which were seated in Kent and Staffordshire. There is also mention of a John Barrett in old records of Blythborough, Suffolk from the reign of Henry VI to that of Henry VIII. The forebear (in the Barrett family) of Elizabeth Browning was one Hearcey Barrett who was related to the Belhous line. He went as an officer in the conquering army of Admirals Penn and Venables (sent by Cromwell) to Jamaica, West Indies. When the troops disbanded in 1660 he settled in Withywood, now known as Vere, Jamaica where he became one of the most successful planters on the island. Several generations later, his descendants moved back to England. Notable in Great Britain, the Barretts were among the first settlers in America. The first to arrive, according to extant records, was Margaret Huntington (nee Barrett), a descendant of the John Barrett above. She settled in Roxbury, Mass. with her children in 1633, her husband having died on the voyage from England. Thomas Barrett emigrated sometime between 1633-1640, settling in Braintree, Mass. where he resided with his wife, Mary, and their children until 1663 when they purchased land in Chelmsford, Mass. It is believed that they had five children, but there are only three names registered: John, Joseph and Thomas Jr.. There were two girls: Mary who married Sidrath Thayer and Margaret who married Joseph Parker, who are thought, by many family historians to be daugthers of Thomas, the immigrant. Among other settlers in Massachusetts were: Humphrey Barrett who came in 1639 and settled in Concord; James Barrett who resided in Charleston and John Barrett who settled in Marlboro. There is a throry, not proved, that all these Barretts were related. There was a group of three brothers and a sister: William, John, Thomas and Lydia who came from Norwich, England. Lydia married Bartholomew Cheever. Barrett Beginnings #6 -- Did Barretts arrive in England with William the Conqueror? The day after the Battel (the Battle of Hastings, 1066) very early in the morning, Odo, Bishop of Baieus, sung Masse for those who were departed. The Duke, after that was desirous to know the estate of his battel, what people he had therein lost and who were slain. He caused to come unto him a clerk, that had written their names when they embarked at S. Valeries, and commanded him to call them all by their names, who called them who had been at battell, and passed the seas with Duke William. Those who fought under the ducal banners of Hastings took every possible means to have their names included on the lists so as to be well thought of and remembered by future generations. The names were written on the role and hung in the Abbey of Battel. After the Battle of Hastings, Duke William ordered that an Abbey be built on the battle site. The afore mentioned muster roll was lodged in the Abbey and became known as "The Role of Battle Abbey". Several people made copies of the roll some of which for some reasons or other added names to it. Holinshed in his copy included the name "Barrett". The preference as to which copy of the roll should be considered authentic should be that of John Leland as he saw and transcribed the original. Leland's copy included the name "Baret". In his chapter concerning families which entered England from foreigh countries the author writes: "The greatest import of French names and families since the conquest, was at the revocation of the Edict of Nantes; hence date Ducarels, Bernonvilles, Chamiers, Palairets, Guardots, Laprimaudayes, Tessiers, Barrats, Romagnes and many others. Information on this site is deemed reliable but is not guaranteed. Researchers should personally verify data collected on this site before including it in their own genealogies. A friend once asked why I study my family's history. The simple truth is that I love my family very much and will miss those who have passed away until it's my time to join them. To honor their memory in this way ... keeping it alive for those who come after me ... is such a small tribute to the happy years we shared together. My (only) regret is that I did not get "hooked" on genealogy in time to ask my grandparents all the questions I am chasing now.